This information is distilled from [Cannon 2004]. There are two types of pressure lubrication (grease) fittings found on early Plymouths: Zerk and “Alemite hydraulic”. 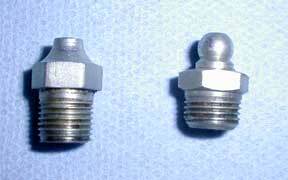 Both were manufactured by Stewart Warner. The Zerk fitting, shown on the left, was used on Plymouth through 1933. The “modern” “Alemite hydraulic”, shown on the right, was used on Plymouth starting in 1934.